Hello all. 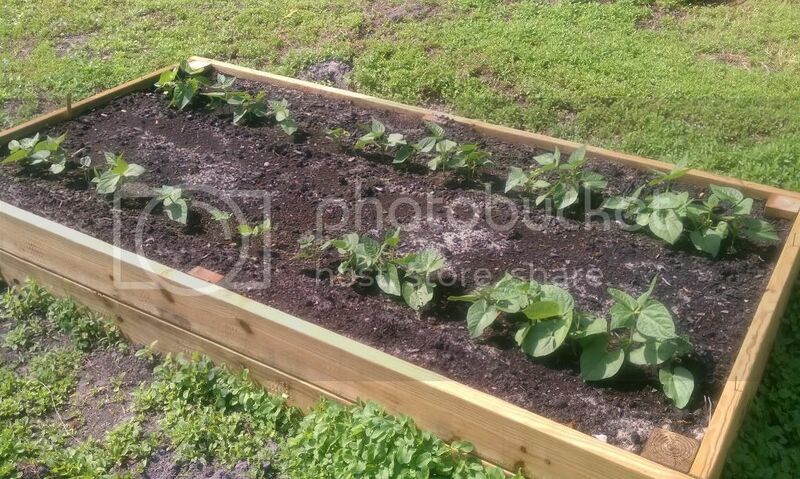 I planted bush beans from seed into a raised bed on 2/20, exactly one month ago, and theyre not doing much. Some are 6 inches tall and look healthy, but most are small and not growing much. They get at least 8 hours of good sunlight, regular waterings, and are planted into a rich but well draining compost. All of my other plants, in other raised beds, are doing well. Any ideas of what I'm doing wrong? Should I dig them up and start over? I would post a picture but I don't know how. I live in NE Florida, zone 9. Hearing multiple issues with beans lately, and knowing that most folks go chemical for ferts (which can destroy soil biology), you may need to add back the rhizobium (bacteria that beans need to fix nitrogen). Your beans look, good and have good color. I recommend you give it some time and just be sure to keep them watered. Oh, you need to put the url between the img tags. Have a great day! Good luck with the green beans! But...do I understand correctly that they were planted in 100% compost? You are so close to posting pictures. You just needed to move [img]to%20the%20front%20of%20the%20url. [/img] was in the correct place. They're planted in a compost, peat, sand mixture. It was recommended to me that I plant straight into the compost, but after seeing it and doing a drain test there was no way a plant would have survived. It's mostly compost with a bale of peat moss and a few wheel barrows full of course sand. All of the other veggies are thriving so I guess I got the mixture right. I'm still learning at this. The top picture was about a month ago, the others are from this past weekend. 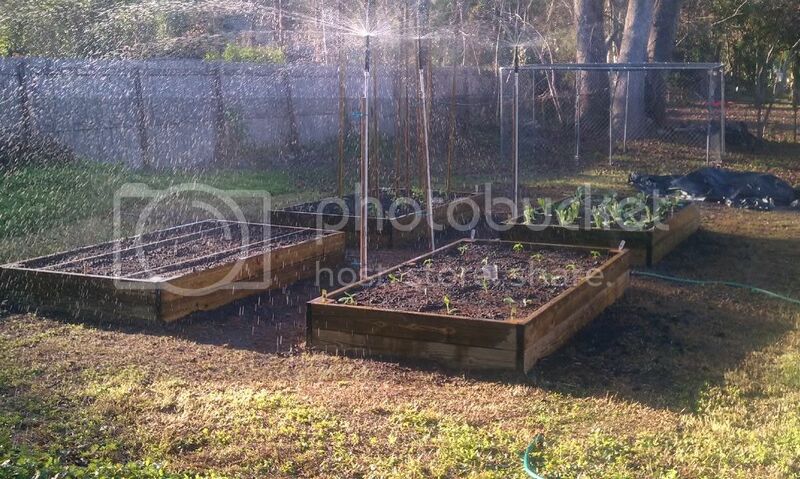 Next weekend I will be working on a drip irrigation system because my sprinklers are watering more weeds than veggies. How did you mix the different ingredients? Maybe this one bed had less compost? Did you inoculate the beans? They maybe ok with more time and or you could try a little Hydrolyzed Fish fertilizer. I was pretty meticulous with the soil mixture, counting out the wheel barrow loads as if it were a chemistry project. I think they are all pretty close to even. The more I think about it I think that it is the seed, Burpee. Only about half of the seeds sprouted. I put 3 seeds in each hole and only one of them has 2 plants in the same spot. I checked the expiration date and they were labeled for use in 2011, and expire in November. I'm going to do some research on saving my seeds to use next year. May I comment about your soil mix without offending you? Compost by itself is not a good growing medium. Compost is best used as a soil amendment. It adds nitrogen, and minerals. It is too rich and too coarse to be a good medium by itself. When I say soil I mean that wonderful layer of material that nature has left on the surface of our planet in many areas. Soil consists basically of clay, sand and silt. Soils vary around the world, but these are the main constituents in soil. Peat is sterile and as a growing medium really has nothing to offer. If it dries out it is slow to absorb moisture again. It has been used extensively as a potting medium, but must be chemically enriched with plant nutrients. It is abundant, cheap and light weight. It is often mixed with perlite which is also worthless except for a filler. These things have been useful in starting mixes, but as a main growing medium have nothing to offer. Sand is ok, but fine sand may be better than coarse. Sand with a little clay mixed in, even better. Soil needs some fines in it to restrict air pockets. All of the materials you used are quite coarse. You said it is well draining, perhaps too fast draining? Fines hold moisture better and fine clay is more chemically active and provides minerals. In any case, all of your plants will quickly put roots down into that natural soil your beds are sitting on. (If you didn't put a barrier?) Many plant roots go from 4 to 8 feet deep. Beans not quite so deep. I am thinking your beans are wanting for water. That is why I suggested keeping them well watered. As soon as their roots get down into the soil under the beds you will see them perk up. If I can make a suggestion to anyone building beds, it would be to excavate ten inches or so of the natural soil, then as you fill your beds mix that with whatever you are using to fill the beds. Avoid peat and use fine sand and compost. Sometimes natural topsoil is available and this would be a good choice for 70% of what you fill raised beds with. What can be a better growing medium? It is what most of the plants in the world grow in. It is what feeds the inhabitants of the earth. Do you think that we, with our limited experience, can make up something better? Actually you don't even need soil to grow plants. The school of Hydroponics tells us that. However you do need to supply everything the plant needs in the right proportions. Water, nutrients, and physical stability. All things that soil can do for us very well as long as it is balanced properly. What is the soil your beds are sitting on? Have you taken a sample in for a soil test? You may be sitting on a gold mine. It looks like it grows weeds very well. Maybe plant a few beans in that soil and see how they do? It is my guess that many gardeners cover up better soil with their beds than they put in the beds. Give those beans a good deep soaking. Ok, as I have said before, if you ask ten people you will get ten opinions. In the end you will work out your own methods. Good luck! that's not a good germination rate for beans, as you've said, jennie, and could be a good indicator for why growth is slow/stagnant. saving your own should do it, (for the future), or perhaps a different source. i'd blame the seed in this one, before the growing medium mixture. jal, no offence taken at all. I will gladly accept any and all advice, I am a novice. The compost that I got from my local mulch and rock place is hard to describe. It was a very fine texture but when it was wet it got really sticky and wouldnt drain at all. Some of the compost had gotten wet and when the truck delivered it a 1/4 of it was compressed into big clods. They were very hard to break up. After I did my drainage test I figured that my plants roots would suffocate and drown. The peat moss was a waste of money, I didnt realize what it was (saw dust) until I opened the bale. I think the course sand is what helped my drainage issue. Each year I am going to incorporate more compost, compost that I am going to shop around for and be more picky with. My soil here is very sandy and most stuff grows pretty well, especially weeds! I planted tomatoes along the side of my house last year. They grew as tall as the eaves of my house (9ft). The only thing I did, besides constantly re-staking them, was till in some composted cow manure before I planted them. I did till the soil under the beds down about 6-8 inches. I think that was adequate because we don't have an issue with hard packed soil. The peat moss was a waste of money, I didn't realize what it was (saw dust) until I opened the bale. Was it sphagnum peat moss or saw dust, they are not the same. One usually comes from a lumber mill and the other from millions of years of process. Neither have any nutrient value.